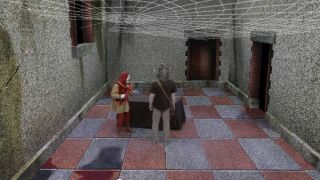 Cult kids TV show Knightmare has returned after 19 years thanks to YouTube's celebration of geekery – Geek Week. The new episode reunites dungeon master Treguard and Lord Fear and manages to retain the show's (now) lo-fi look, as well as bring it kicking and screaming into 2013 with Peep Show's Isy Suttie muttering the curse word ever heard in the dungeon. There are other, less sweary changes, too. Instead of excitable kids shouting at their mate wearing a horned helmet, the show has been packed with YouTube stars, including DanIsNotOnFire, Amazing Phil and Emma Blackery. If you fancy a bit of old-school TV, then close the curtains, remember it's only a game and watch below.